Online news aggregation and curation startup Publish2 is today at the TechCrunch Disrupt conference launching a new product dubbed Publish2 News Exchange, with the ambitious goal of disrupting the entire reason for being of The Associated Press. The AP being the cooperative owned by its contributing newspapers, radio and TV stations in the US, which operates a monster news and photo distribution network that non-contributing media organizations can subscribe to (for a hefty sum, evidently). And my educated guess is publishers are going to love this. 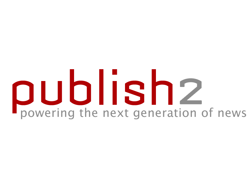 Publish2 announced an initial $2.75 million round of financing back in March 2008. At the helm of the company we find Scott Karp, former Director of Digital Strategy for Atlantic Media and publisher of The Atlantic and current Editor & Publisher of Publishing 2.0, a widely-read industry blog. The startup can also fall back on a solid set of advisors (Stowe Boyd, Dan Gillmor, David Cohn etc.) and quite an impressive board of directors (which includes people like Robert Young, Kurt Johnson, Howard Weaver). Does Publish2 really have the potential to destroy the AP and help publishers survive and thrive thanks to free online content publishers? Time, as ever, will tell, but we can’t help but cheer for this one. Philip Kaplan: on one hand, feels like selling paint to the Titanic. Also not sure if I want newspapers to survive and thrive, as they’ve basically disrupted themselves. Josh Williams: Great presentation. Cutting out the middleman is very interesting. Chris Fralic: You explained the problem really well. The press will love it, as will the blogs. Jeffrey Bussgang: felt like selling vitamins to dinosaurs. Where’s your business when newspapers die? What’s the value proposition then? Response: the brands will survive on the Web, and we can play a role in that story as well. Jeffrey Bussgang: The question is how big the window of opportunity is. Publish2 wants to be in a position of trust and authority, that will ultimately be very profitable in an admittedly shrinking market. Scale is key. Philip Kaplan: are you charging for the content or is it advertising-based? Response: we’re not charging, but content owners can and then we take a transaction fee. If the content is free, we have the licensing fee model. Philip Kaplan: It makes sense, and that’s why we invited you back. Reducing the expense for publishers makes sense. But making an ad network out of it at some point, is going to prove very, very hard. Why not just sell the hell out of the content that you’re offering? Response: yes, that would be fantastic. Jeffrey Bussgang: How big are the budgets you’re going after? Response: $30-$40 million for the AP disruption part, and then there’s the international aspect. Chris Fralic: Shrinking AP’s market – what would you expect them to do? Response: ignore us in the beginning, then reduce their business to provide the same kind of value. By the time, they will, it’s going to be too late. We can stay way ahead of them.